Property matters. In China, it matters massively—not just as an investment, but increasingly in some localities as an asset to be safeguarded. Recently, a community in Jiangsu illustrated that the narrative of home purchases and upgrades in China shouldn’t only be about bubbles about to burst (even though they never seem to do so) or about nail-house owners who refuse to move unless the government meets their demands for compensation (which in many cases the local authority yields to). The story of home buying in China is also about the inclination of some in the upper-class to employ violence to defend property. Much is made of China’s growing middle class—a concept which is amorphous at best, another projection of Western stereotypes on a society that’s simply too diverse to tolerate such a template. Rarely do observers identify with any precision where the middle-class in China starts or stops financially, or investigate why Chinese themselves rarely if ever refer to themselves as “middle-class” [中产阶级] and why many prefer the moniker “mortgage slave” [房奴]. The appellation denotes economic status for residents of China, but outsiders tend to ascribe all sort of political dimensions to "middle class" here--a desire for government accountability, a quest for participation in the policy process, and the like. Chinese citizens often see matters otherwise--an issue of financial position, not of political leanings. Moreover, the assumption in much of the international media is that property owners in China must be “middle class” in the same sort of Western sense, and that their growing numbers (whatever those are) are a direct challenge to the Communist Party, purportedly because their interests don’t align with the ruling leadership—though why that’s the case here remains entirely undemonstrated and is quite wrong. Hardly any mention is made of a housing market that was created by Beijing’s policies after all, and why a buying of a home here almost always demonstrates hope and joy, instead of illustrating smoldering social resentment that’s about to suddenly topple authority—reasoning that really has no connection to China’s local reality. There’s also hardly any discussion of what Chinese residents do with the property that they’ve purchased. Many new owners renovate in ways that are at least somewhat outlandish (giddy, one might say) and off-putting to one’s neighbors. Some purchasers illegally restructure parts of their homes or grab adjoining land for their own private use, acting illegally and without permission, flaunting rules and regulations to their own ends. 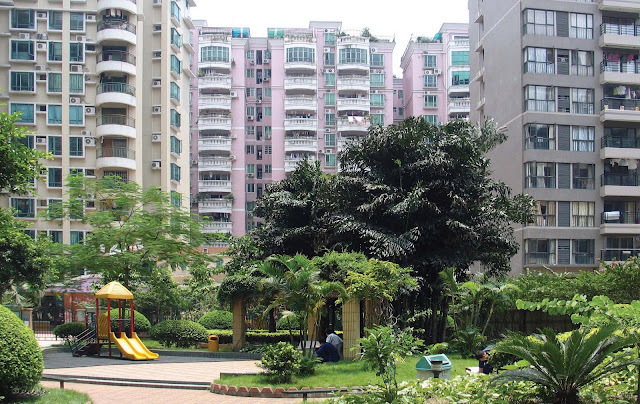 It’s the latter that happened in the aforementioned instance and locality--a gated Jiangsu community that’s a mix of 4-5 story apartment buildings and separate villas, populated primarily by retired government officials, party cadres, and military families. There’s nothing especially exclusive about the community, save that it was one of the first large-scale projects inaugurated in the area by the local government, and many well-connected people were granted ownership of apartments in appreciation of their previous employment by and service to the State. (In the years that followed, apartments in many newly constructed buildings were often gifted to local officials by developers grateful for the green light that allowed them to build in the first place.) Some homeowners in this particular community do enjoy a level of local influence through previous relationships, to be sure. But many have now moved elsewhere and the compound is full of almost as many new owners as old. The villas are another part of the story. 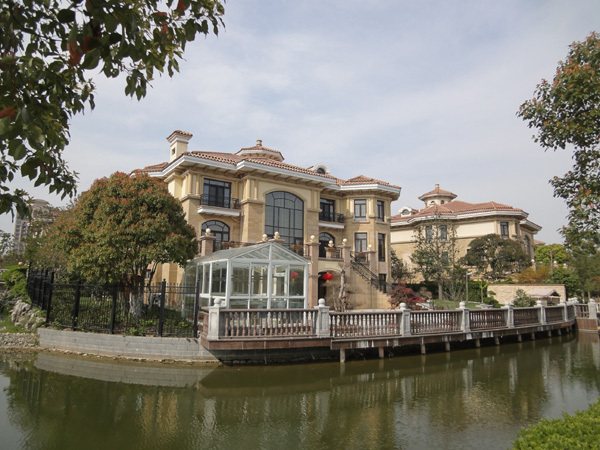 They were built to entice foreign managers and company owners to bring business to the area, but they’ve long departed as well, replaced by affluent Chinese who aren’t looking to emigrate--or actually want to own a large home in China, as well as abroad. A number of the villas are currently being renovated, upgraded to more opulent standards. It’s one of these villa owners who started the contretemps in question. He decided to extend his property line into another’s yard in the course of renovating his home. The adjoining neighbor protested and sought out assistance from the property management, which dithered about putting a stop to the expansion—something that occurs more often than not in local China, especially when, as in this case, the current management is supervising the community illegally, having lost its authority some months ago when residents chose not to renew the company’s charter when their 3 year term expired and the local court upheld that decision on appeal. The offending homeowner though was not certain that the property management office wouldn’t step in (it’s likely that at least some in that office were interested in doing so for purely mercenary reasons, and wanted some consideration or compensation for their intervention). And so the homeowner who wanted to skirt regulations called in reinforcements. The first wave landed rather awkwardly: A handful of badly uniformed workers pretending to be police. The community’s security people had no idea who they were, as they appeared out of a renovation van they unknowingly let through the gates instead of announcing their presence to the property management company. It became clear quickly that their role was to deceive residents into thinking that they represented official authority in the matter. Their ill-fitting outfits and farmer footwear gave them away, and security guards compelled them to sit down and stay put. Meanwhile the real action was taking place at the gates of the community residence, as a dozen or more tee-shirted, heavily-muscled, tattooed men sought to gain entrance, saying that they were “visiting a friend who invited them to a party”—and gave the address of the villa owner who wanted to secure the new property line. Evidently, they were there to threaten the angry next-door neighbor with retaliation if he refused to allow the change. Remarkably, security guards refused to allow this group past the poorly built gates to the compound, despite threats by the assembled to breach the barrier. There was pacing, much finger-pointing, many cigarettes offered and not a few bottles of alcohol offered to those guarding the community. Finally, after over an hour of confrontation and the threat of combat, a single police car (official) rolled into the residence area, the contingent withdrew, and the rent-a-cops inside disappeared, having ditched their clothes in the van they arrived in. It’s not at all clear that the struggle is actually over, but at least that standoff ended. Dramatic in its own way, this instance is all too typical of trends in many of China’s old and new localities. Many property owners in China don’t see ownership as another step towards inevitable democracy for the nation, but bestowing an inalienable right to deny Others (i.e., not members of the upper-classes) what they have and what those Others don’t. This isn’t a new middle class seeking mediation, nor a situation where property rights is creating a new class of citizens demanding more rights from a government reluctant to grant them. At China’s local level, this is property emboldening individuals, bestowing (at least in their eyes) a curious sense of entitlement to use power--which in local China incorporates violence if necessary. Consultation is supplanted by confrontation. These are homeowners not looking to overthrow the government, but simply ignoring it, and trying to settle local matters as if they are the authority. That’s hardly community-oriented or emblematic of a model middle class. Indeed, such attitudes and the actions of a privileged few have more in common with despotism than democracy. Property rights in China aren’t producing local political pluralism, but all too often serving to undermine what little is left of it. This is a great blog. It deserves more exposure. If you don't want to offer subscriptions (operating them costs $$) why not make it available by RSS feed, which is free? Thanks very much. Will look into that further. Godfree above put you on to me. I am an author/journalist based in China. I have a podcast show called Radio Sinoland and would love to have you on. My show gets many thousands of listeners around the world, so it would be good exposure for your fine work. My website is www.chinarising.puntopress.com. My email is jeff [at] brownlanglois.com.